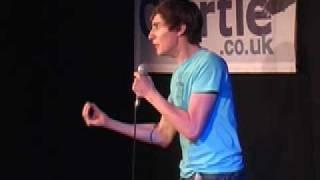 The son of sports commentator Jim Rosenthal, Tom was a finalist in the 2008 Laughing Horse new act competition and the 2009 Chortle Student Awards. And in 2011 he was joint winner of the 2011 Leicester Mercury Comedian Of The Year title. He landed a central role in the Channel 4 sitcom Friday Night Dinner in 2011, as one of two Jewish twentysomething brothers (alongside Simon Bird) who revert to childhood roles at the weekly family meal. We do not currently hold contact details for Tom Rosenthal's agent. If you are a comic or agent wanting your details to appear on Chortle, click here.